New Belimo ZONETIGHT™ Zone Valve - Efficient in Every Way. 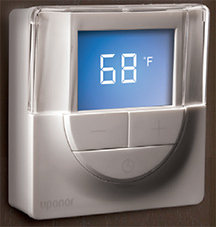 New Uponor wireless control offers efficiencies for radiant systems. Uponor Norther America is proud to announce the next generation in wireless controls for residential hydronic radiant floor heating systems. The new Climate Control Zoning System II features an innovative technology called Autobalancing that boasts 25% faster reaction times and up to 20% greater energy savings for radiant floor heating systems. • Improved comfort and efficiency Autobalancing feature offers 25% faster reaction times and up to 20% greater energy savings.